All new and existing players are required to self register each year to our club. Please click on the link above and fill out the required fields, checking all your details are correct. Tick the T&Cs and submit. It should come up that you have successfully registered with Singleton. If you do not receive a confirmation email, or are transferring to Singleton from another club please contact Paul Kelly on 0419 741 466 for support. There are two options this year for the payment of senior fees. The club has set this fee schedule as an incentive to pay early & provide operating funds as soon as possible. It also allows those players who may not be available for the whole year to pay-as-they-play. A club polo shirt is included in your registration fee. VERY IMPORTANT: please ensure you include your name in the payment comments so we know you have paid. Team managers Dayna & Rosie will be keeping tabs on this throughout the year & only those players who have paid or are paying weekly fees will be allowed to play. All participation players must register to Singleton Roosters AFC each season. A Registration Day will be held once again at Gowrie Street Mall at the end of February. Players can also register online. Click the link, www.newcastlejuniorafl.com.au. and become a Rooster today. 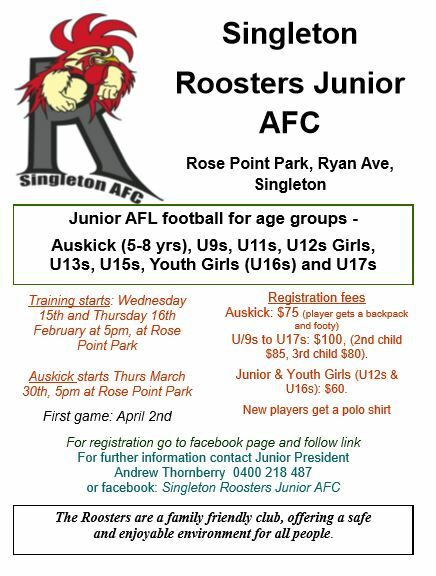 Follow Singleton Roosters Junior AFC on Facebook.